The purchase was made possible through an advocacy project of a Mt. Laurel grad student. Director of the Camden County Library System Linda Devlin, alongside Freeholder Bill Moen and Mt. 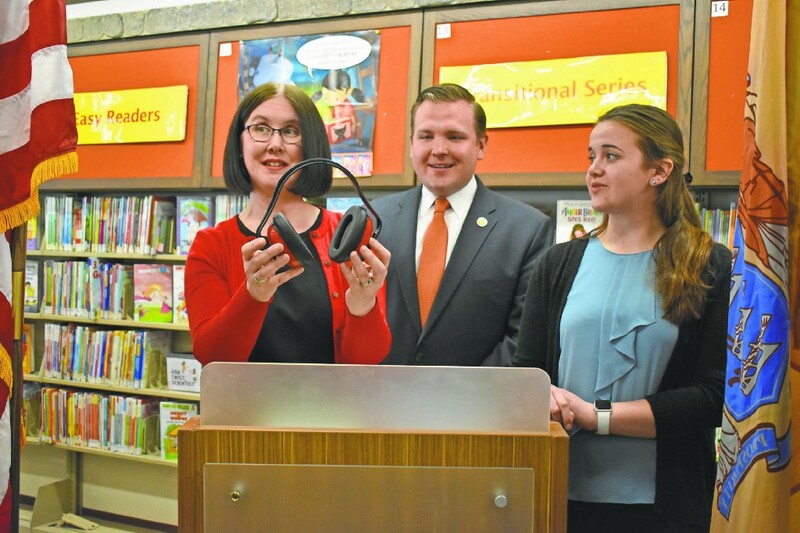 Laurel graduate student Emily Whitley, present the Vogelson library’s new set of headphones designed for children with auditory sensitivities The South County Regional will also receive the noise-canceling headphones. Local libraries are now accommodating an underserved demographic — children with auditory sensitivities. Recently, the Camden County Library System added nearly 50 noise-canceling headphones to the M. Allan Vogelson Regional Branch and South County Regional Branch, striving toward the inclusion of young people struggling with sensory processing issues, including those individuals who fall on the autism spectrum. The two branches purchased the sets of youth-sized headphones through a Mt. Laurel graduate student’s GoFundMe page. Emily Whitley, who studies school counseling at the College of New Jersey, kicked off the campaign last summer after she was assigned an advocacy project a few months prior. Whitley raised approximately $1,000 for the headphones. “I had this idea about children with sensory sensitivities and that they were really underrepresented from the research that I had done, from the classes that I took — that it’s mentioned but not highly focused on,” Whitley recently told a crowd at the Vogelson branch. For Whitley, who studied child health and development during her undergraduate career, her advocacy efforts reached well beyond her spring semester multicultural counseling class, connecting with the Camden County Library System, which showed an interest in her headphone initiatives. Fusing her own love of the library, Whitley thought this environment would act as an ideal setting that concurrently promotes socialization and knowledge. “I know how amazing a library can be and the type of exploration that they allow,” she said. After raising money over the summer, the county purchased the equipment in the winter. As of now, the headphones can be found in the children’s libraries of the Voorhees and Winslow Township locations. But the county has plans to expand the accomodations to other branches, as well as invest in adult-sized pieces. Moen noted that, according to the Centers for Disease Control, New Jersey has the highest rate of children who identify with an autism spectrum disorder, as the state maintains a statistic of one in 41 children, as compared to the national rate of one in 68. He says children living with sensory sensitivities may be extra sensitive to tactile senses, auditory stimulation, visual stimulation, olfactory stimulation or any combination of these. However, the most common sensory sensitivity is related to hearing, which, although it seems to be an ironic library concern, is actually quite prevalent, since the branches often serve as bustling community hubs. For Whitley, it’s amazing to see local people, especially those with sensory sensitivities, benefit from her idea that all sparked with a college assignment. She plans to continue aiding this project and the population it nurtures.